2 Benefits of Investing in a Compact Toilet? 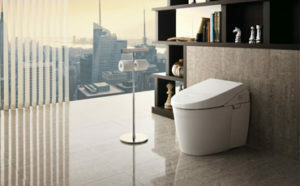 3 How to Select the Best Compact Toilet? Did you know that the average person spends roughly 3 years of their life sitting on a toilet? This merely outlines the importance of picking the right toilet, even though it may seem like a mundane, run-of-the-mill item. Also, even if you don’t enjoy the luxury of having a large, spacious bathroom, this doesn’t mean that you should get the first toilet that crosses your path. 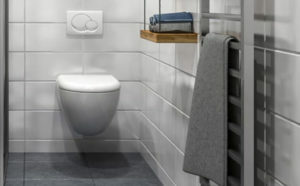 There are various high-quality toilets for small spaces that rank high in terms of comfort, practicality, and durability – which are among the main considerations you should take when shopping for toilets. Of course, a toilet is a serious investment, as it should last for a decade, at the very least. This is why we believe that you’ll find our guide useful, as it contains all the information you need for making the right purchase, as well as our recommendations for compact toilets for small bathrooms. Dimensions : 24.5 x 14 x 27"
Dimensions : 27 x 17 x 28"
If your bathroom is small, every inch of space matters to you. This is what makes this particular product worth considering. That is to say, it measures 14.5 x 18.25 x 15.75 inches, featuring an elongated shaped bowl. At the same time, it doesn’t have an external water tank. That’s because this toilet utilizes an electric flushing mechanism. On a different note, in terms of efficiency, this toilet is great, considering that the flushing mechanism has a timer. This way, it uses no more than one gallon of water per flush. A potential drawback could be the fact that it is rather noisy. 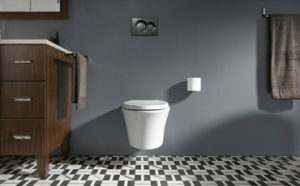 Still, the compact, modern design of the toilet, its durability and water-efficiency make it a good investment. The elongated shape of this toilet ensures that it is comfortable, whereas the one-piece design makes it ideal for small spaces. 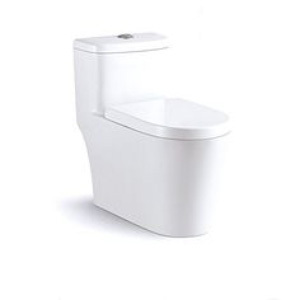 Featuring a streamlined shape and a genuinely powerful flush, this toilet uses less water than standard models. More specifically, it utilizes 1.6 gallons per flush, meaning that this model fits into the category of toilets that consume less water. 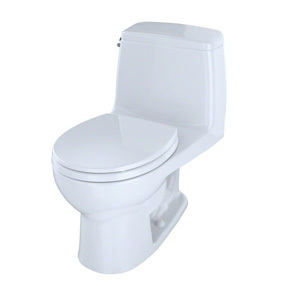 However, it’s the piston action accelerator flush valve that distinguishes this toilet from other models. The valve pushes the water faster than a standard valve toilet while keeping the water consumption under control. Even so, in some instances, you might need to hit the flush button twice – which could be a minor drawback. 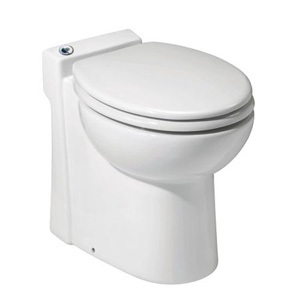 This is another high-quality compact toilet, measuring 14 x 24.5 x 27 inches. Supposedly, the most attractive characteristic is the fact that the compact size doesn’t jeopardize the comfort level, in any way. 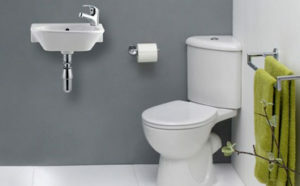 At the same time, thanks to the dual flush system, each flush is quiet and smooth. To be more specific, the ½ flush utilizes approximately 0.8 gallons per flush, while the full flush uses roughly 1.6 gallons per flush. Moving on, this toilet features a self-cleaning gazed surface. This makes it less prone to rust, scratches, fade, or discoloration. A small inconvenience could be that the toilet seat is likely to move. 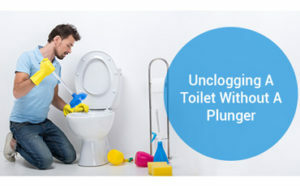 However, this is quite common, meaning that you have to tighten the hardware connecting it to the toilet. 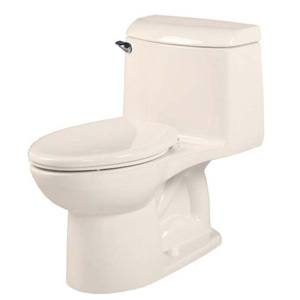 This is a sturdy one-piece toilet that will effortlessly fit any compact bathroom. The elongated bowl facilitates a high comfort level while occupying a minimum amount of space. Thanks to the 1.28-gallon high-efficiency flush, you can save a lot of water – especially in comparison with standard toilets featuring a 3.5-gallon flush. Even so, this doesn’t mean you should worry about impaired performance. As for the height – it is just right. It is just as sitting on a regular chair. However, is this toilet comfortable? 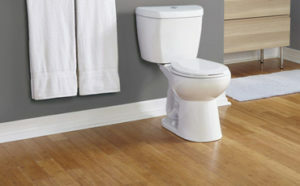 Many people assume that when they invest in a compact toilet, this means sacrificing their comfort. This toilet proves the opposite. On the other side, this toilet might require more cleaning than other similar items, due to the low water use. The first thing you’re bound to like about this model is its sleek design. At the same time, the power gravity flushing system is equally powerful and efficient – in the sense that it manages to flush everything. Additionally, it is rather quiet, which comes as another advantage. Moving on to its water usage, it uses 1.6 gallons per flush. Concurrently, this model is rather easy to clean and maintain. This is primarily due to the Sani-Clean coverage, meaning that the surface is smooth so that nothing sticks to it. The height of the model is standard, as well. Therefore, there should be no surprises in this department, even though the unit is so compact and space efficient. If you’re thinking that a corner toilet is a right addition to your bathroom, this particular item might be a great purchase for you. This way, you can truly maximize the space you have at your disposal. The height of this model is quite nice, as well – making it really comfortable, an important characteristic for most users. Moving on to the flushing of this toilet, you should note that the tank contains sufficient water so that the model uses more than 1.6 gallons per flush. However, the handle is a bit stiff, in the sense that it requires a bit of extra effort to flush. Benefits of Investing in a Compact Toilet? 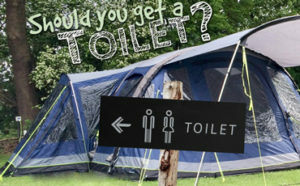 Which is the primary benefit of investing in a compact toilet? Evidently, if your bathroom is small, a compact toilet will be the right choice. 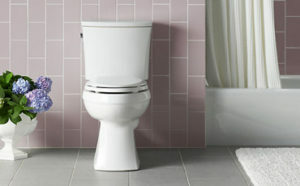 In comparison with standard-sized toilets, a small toilet will occupy approximately two inches less floor space. At the same time, persons that use a wheelchair or a walker to move around the bathroom will find that every inch of space matters. Aside from that, picking a compact toilet means that you’ll have less space to clean! This is always good news because no one enjoys cleaning the toilet, right? On a different note, houses with children might also benefit from small toilets, as opposed to getting standard-sized models. That’s because you get additional floor space, not to mention that children find smaller toilets easier to use. 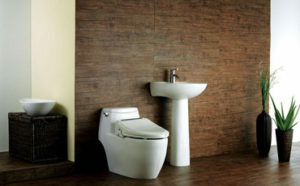 How to Select the Best Compact Toilet? A small bathroom asks for a small toilet. This is why you cannot take any chances and get a toilet that doesn’t fit. Make sure you triple-check the measurements beforehand. As a rule of thumb, you should focus on measuring the rough-in dimensions. This refers to the dimensions from the center of the toilet flange to the wall. This measurement accounts for the rough-in size of the toilet. In the worst-case scenario, if you don’t get this right, you might need to send back the toilet and have it replaced; so, don’t overlook this. Concurrently, considering that you’re switching from a round bowl to an elongated bowl, note that there is a size difference between them. That being said, make sure you consider this since every inch of space counts when it comes to small spaces. Nowadays, every individual should consider his/her impact on the environment. While it is true that you cannot eliminate this impact entirely, you can attempt to reduce your carbon imprint. And one of the many ways in which you can do that is by diminishing your water usage – this applies to your toilet, as well. According to this source, more than 47 percent of the water that Americans use in their homes is from their bathroom. Concurrently, roughly 24 percent is utilized by toilets. The good news, however, is that by installing a new toilet, you can do something in this respect. 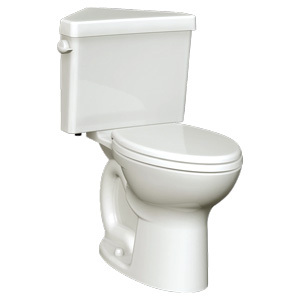 Did you know that old toilets could use up to 7 gallons of water per flush? This is a lot. The good thing is that newer toilet models utilize less water, and this doesn’t reduce their flushing efficiency, contrary to popular belief. And while a toilet that saves water might be a bit pricier than an older model, in the long run, you will be saving money. That’s because your water bills will be smaller. As a matter of fact, it would be safe to say that, in a few years’ time, the money you’ll save on water bills will compensate the upfront investment of the toilet. 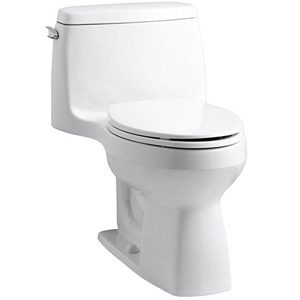 At the moment, the federal standard for toilets is 1.6 gallons per flush. In fact, there are some models on the market that use less than that. This means that you have plenty of options to choose from, and still manage to save water, over the course of time. A toilet’s efficiency refers to the amount of water it uses. And this is imminently linked to its flush rating. 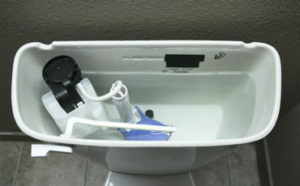 Depending on the manufacturer, each toilet features a specific flushing system. For example, some models have a large trapway that prevents clogging, while others have large flush valves. These allow more water to be flushed more powerfully, at a fast rate. To ensure that you get the best value for your money, always factor in this aspect. This also applies when it comes to shopping for a reverse osmosis system. For example, in the case of the Portable APEC RO-CTOP-C, for each gallon of filtered water it produces, it utilizes only 2 gallons of water. This could make a difference, especially since other systems utilize 3 gallons of water or more. That is the case, at the very least, with the APEC ROES-PH75 Alkaline Mineral pH+ Osmosis Filter, which uses 3 gallons of water for each gallon of pure water it produces. Did you know that 52 percent of women clean their bathroom at least once a week, whereas only 34 percent of men clean the bathroom once a week? 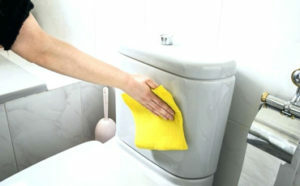 Maintaining your toilet clean at all times is extremely important. Otherwise, the risk of germs spreading in your bathroom is greater. 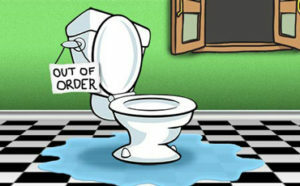 As an extra tip, you should always close the lid when you flush, in order to prevent the germs from spreading. On a different note, if you want to be 100 percent sure that the water you drink is safe, picking a reliable water filtration system is the way to go. Leaving that aside, some toilets are easier to maintain than others. This will depend on the material used by the manufacturer and the design plays an important role, as well. That being said, you should pick a model featuring a high-quality glazed bowl. As for the shape, one-piece models feature fewer crannies and nooks to clean, in comparison to two-piece bathrooms. That is not all, some models feature SanaGloss or EverClean technologies, which aim at maintaining the toilets clean for an extended timeframe. Aside from that, due to these technologies, the amount of time required for cleaning the toilet is significantly reduced. Some of the models on the market offer you the option of choosing comfort height. What does this mean? In simple terms, this includes a taller seat, which translates into a higher degree of comfort. While it is true that smaller toilets are perfectly suitable for children and short adults, taller individuals, elderly and disabled people might find them uncomfortable. In this situation, we recommend you to take a look at the comfort height toilets. This way, you can choose a compact toilet that is right for your small bathroom, and still enjoy a significant level of comfort. Essentially, the extra height in your seat won’t take up any additional space. Hence, if you think that you could do with a tall toilet seat, you should definitely get one. It goes without saying that each person has different style preferences. And this also applies to bathroom decoration as well. And while a toilet is a functional unit, first and foremost, this doesn’t mean that it cannot look good. As a matter of fact, the selection of products we presented in today’s guide proves the opposite. 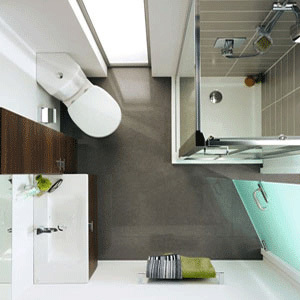 For example, if you prefer minimalist, modern designs, a one-piece model might fit your bathroom better. On the other side, if you’re a fan of traditional designs, a two-piece model might be worthy of your attention. At the same time, you should also pay attention to the color of the toilet. That is to say, you might pick an off-white, or a standard shade of white, depending on the way in which your bathroom is decorated. What are the differences between one-piece toilets and two-piece toilets? Small toilets are separated into two major categories, namely one-piece toilets and two-piece toilets. Choosing the right configuration for your needs will make your bathroom both practical and space efficient. That being said, a one-piece model features several individual pieces comprised in a single seamless unit. Hence, when it comes to design, a one-piece model looks sleek, as it doesn’t feature any crevices between the bowl and tank; not to mention that this makes it easier to clean. That being said, the bacteria won’t reach those small places. On a different note, a one-piece toilet could really allow you to maximize your space. And a couple of inches matter a lot when your bathroom is that small. 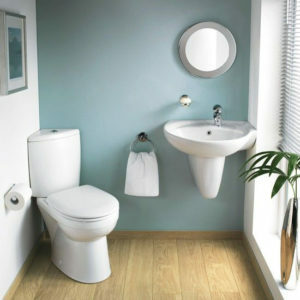 In fact, one-piece toilets are excellently fitted for half bathrooms, in particular. Moving on to two-piece models, they include two separate elements, namely the tank and bowl. As a result, these units might be more difficult to clean than their counterparts. Still, the installation process could be less complicated than in the case of one-piece models. Which bowl shape should I choose? Another decision you should make is picking the right bowl shape. In this respect, you can choose between round-front bowls and elongated bowls. As a rule of thumb, round bowls are perfectly suited for compact spaces, specifically because elongated bowls feature longer rim dimensions. However, the primary advantage associated with elongated bowls is that they are more comfortable for most users. 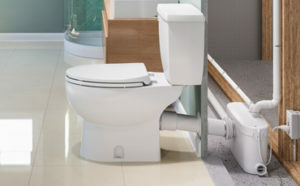 Aside from that, you should make sure that your bathroom can accommodate an elongated toilet before buying one. Even if the difference in sizing is of a few inches only, it counts. If the bowl is too large, it might prevent you from opening the door. So, it all comes down to the amount of space you have at your disposal, and your preferences, of course. What are some of the ways in which I can upgrade my toilet? One of the ways in which you could upgrade your current toilet is by investing in a SmartClose seat, which is equipped with a slow-closing action hydraulic hinge. This way, you no longer have to worry about that unpleasant toilet seat slam. Not only that old lids are heavy and loud, but they are potentially harmful, as well. Slow-close lids are also recommended for houses with children since they are safer. What is the best toilet shape for children? When you’re shopping for a new toilet, it’s critical that it addresses your specific needs. And if you have children, you want to get something that is easy for them to use. In general, compact-sized toilets are better suited for children. This is good news if your bathroom space is limited! Why is that? For the most part, the opening in the center of the seat is smaller than in the case of standard toilets, and this diminishes the likelihood of slipping. In order to maximize your children’s safety, you can also consider getting a children/adult seat combo, which will enhance their comfort and safety. What is the best toilet height? Typically, this will depend on several aspects, as there’s no one-size-fits-all answer to this question. That is to say, the ideal height will depend on your physical needs, your height and the way in which you transfer on and off the toilet. For example, in the case of wheelchair users, the toilet should correspond to the height of the carrier system. For instance, some models facilitate a seat height of 28 inches or even more. Meanwhile, shorter individuals might find a seat height of roughly 17 inches to be more comfy, whereas taller users might prefer toilets that are 19 inches tall. What is the average cost of installing a toilet? It is highly recommended to hire a professional to install your newly-bought toilet. As for the price you’d have to pay for this operation, it depends on the model you choose, as well as your geographical region. For instance, standard floor-mounted toilets are more conveniently priced than wall-hung toilets. This is because the latter requires additional work when it comes to the actual installation process. Still, there aren’t any specific numbers we can give, in this respect. This is why you should discuss with a professional beforehand. 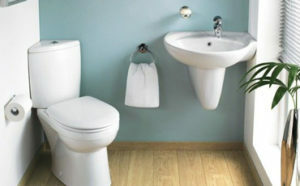 To conclude, we hope that you’ve found our guide on choosing the best toilets for small spaces useful. Essentially, there are numerous things you should consider, when you’re on the lookout for compact toilets for small bathrooms, such as correct measurements, water usage, ease of cleaning, quiet flush, and design. And the good thing is that the market overflows with high-quality toilets that offer good value for the money. Whoever said that having a small bathroom is restrictive should think again: there are many ways in which you can maximize the space you have at your disposal. And one way of doing that is by choosing each unit wisely, ensuring that it addresses your individual needs while being qualitative and durable. If you have other questions or comments on this topic, make sure you contact us!